After a busy weekend, the Eagles baseball team has a little extra time to prepare for some tough competition. The Eagles are on spring break for the first week of April, but have two important games waiting for them on Tuesday and April 9 against Chaparral and Moapa Valley, respectively. Currently, Boulder City is 5-0 for league play, tied for first with Moapa Valley. Last week, the Eagles won games over Southeast Career and Technical Academy and Eldorado. 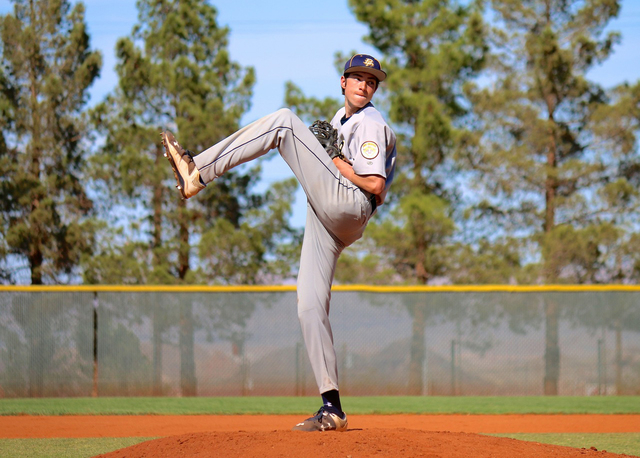 Against Tech on March 26, junior Steve Wagner pitched the first complete game of his high school varsity career. He threw fewer than 70 pitches with 53 strikes and eight strikeouts. Boulder City has won eight of its past 10 games. In seven of those wins, the Eagles played fewer than seven innings because they had scored at least 10 runs more than their opponents. But team members do let how well they are playing get to their heads. They know anything can happen, and take it one step at a time. Reese instills in his team that they need to take every game inning by inning. If they can win every inning they play, they can win the games. “I preach to them that we want to win innings. And if we keep winning innings, then obviously the scores are going to start building up. It’s just an inning at a time, a bat at a time, and just keep putting pressure on them to win innings,” Reese said. Against Tech, senior Seth Kermode scored three runs with four hits and four runs batted in. Junior Nolan Desantis had four hits, one run and three runs batted in. After Boulder City’s win over Tech, they played Eldorado on Friday. The Eagles claimed another win over the Sundevils 14-4, before heading to Anaheim, Calif., for the Anaheim Tournament. Boulder City’s seven-game winning streak ended with a loss to Greeley West 12-9 on Saturday. On Monday, the Eagles were swept by Sonora 6-0, and on Tuesday, the team took another loss, falling 11-4 to Don Pueblos. Boulder City’s final game in the Anaheim Tournament was played Wednesday too late for results to be included in this edition. Contact Rochelle Richards at BCRsports@gmail.com.